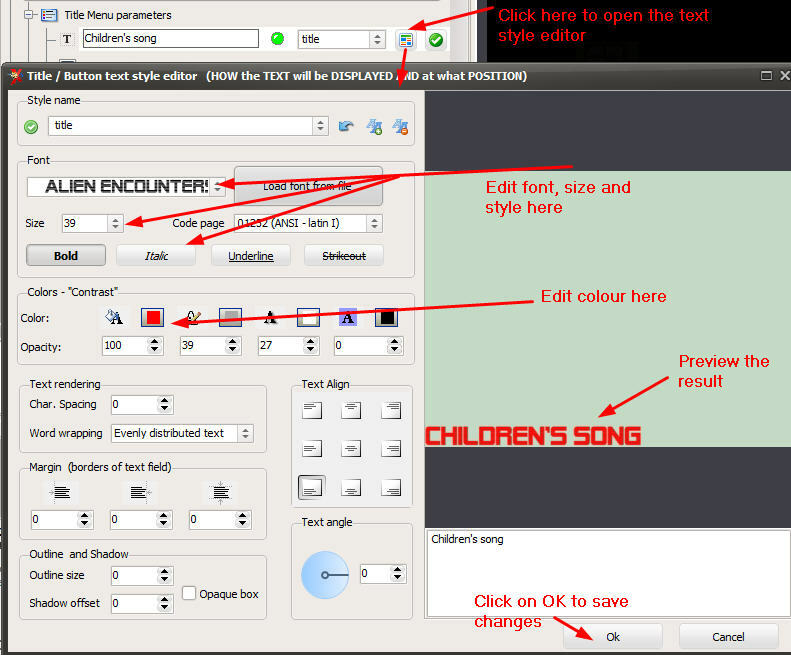 A simple guide to take control over menu creation: what do you see when you insert your DVD in the player? What are the different menu types? How to remove/edit menu templates? If you don't want to go through the guide, skip to the Menu FAQ. The answer to your question is probably there! A new feature of version 6, a clever little feature for a great custom project: add a video that will be played automatically when inserting the DVD, before the menu show up (think of the commercials that play before the menu in commercial DVDs). Open the treeview, click on “Play an intro video” and this will let you choose the video that will be played in intro. 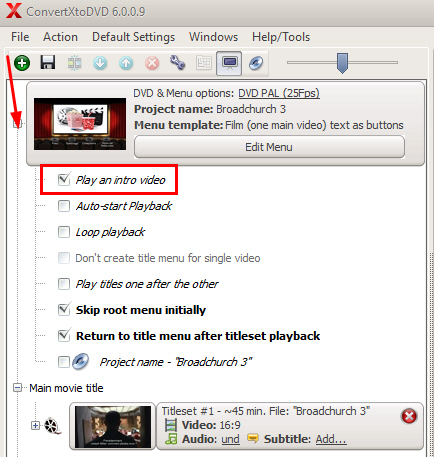 ConvertXtoDVD comes with different menu templates that way you can pick a menu theme according to the video content (thriller, kid, movie, etc.). Each template has different options. Below is the complete list of templates and options. You can also use your own created or modified templates (advanced users only) (edit the .ini files that are found in the templates folder: "C:ProgramDataVsoConvertXToDVD5Templates". Various users provided guides in the forum exist on how to edit these files. The menu selection is done in the treeview or in the general settings. Note: if you do not want any menu at all, select the "no menu" template. In that case if there are more than one video in your project, the first one will play straightaway, and the others will play afterwards automatically. You can navigate through the videos on the DVD by pressing on the >>| button of your DVD player remote control. Green means "editable" (with the max item par page if relevant), red means "not available" and orange means available but not editable/hard coded. For instance if you want to be able to add a background video to your menus, do not pick the Classic or Thriller menu. With VSO programs, two types of menus are created "by default": the Titleset and the Root menus, the latter having three "sub-menus": Chapter and Settings Menu, the Settings menu allows for with Audio and Subtitle selection. By default a Title menu will be made if more than 1 video is converted; it allows you to choose which video you want to play. As a mental note to help differentiate the title and root menus consider the Title menu as the one that lists the titles (videos) that are available on the DVD. A root menu is a menu specific to a video file. The root menu will give you access to the Chapter and Settings sub menus if more than 1 chapter was created for the video in question, and if more than 1 audio track is converted with a video or simply 1 (external - not embedded) subtitle file is converted. If only 1 video/titlset is converted, default settings have it so that only a root menu is generated as theoretically there is no need for a title menu. Below is a walkthrough of the menus and how they are linked. The Title menu is the "general" menu the will play when you insert your DVD. It lists the video(s) that is(are) on the DVD. Depending on the template you've chosen, the display will be different. Some will show the name of the video, others only a thumbnail. 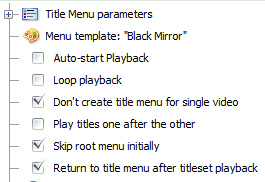 Depending on your menu settings (if "Skip root menu initially" is unchecked) by clicking on each video thumbnail, you will access the Root menu. 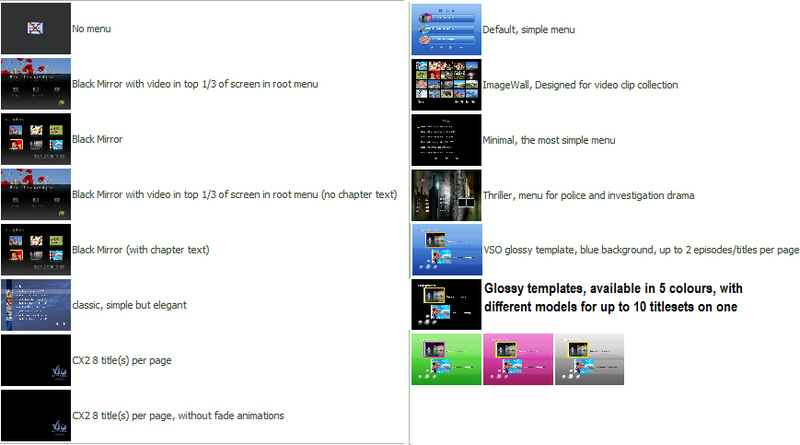 This is the menu that is displayed for each video. It lists and links to the "settings" of the video: Settings and Chapters and enables to play the video. By clicking on the thumbnail or title, you will access the Settings menu and the Chapter menu. In the Settings menu, you will be able to select the different Audio or Subtitle file. (Note: if you don't have subtitles files AND if you have only one audio file, the Settings menu will not show). It's that simple! Again, depending on the template you've selected some of these settings will or won't appear. Contrary to the other menus, the thumbnails cannot be edited in the treeview, but from the "Chapter" tab under the preview. In the treeview under Chapters menu parameters you can only determine the menu duration + background audio and video, and text for the header. Depending on the template, the number of chapter listing that can fit on one menu page is limited. If necessary, additional menu pages will be created and accessible through a "Next" button (with the DVD player remote control). The actual preview only allows to see the first page of chapters created. You can play the chapter of your choice by clicking on its thumbnail. Be aware that some templates will only show the thumbnail, others will include text next to the thumbnail, like "chapter #1..." and as seen in example below. If no Chapter Menu is showing this means no chapters were automatically created or came with your original file. You can insert chapter points manually from the Chapters tab under the preview. Beware also that some Menu templates (see above) do not display a Chapters menu. The Settings menu offers Subtitle and Audio selection. Simply highlight the stream with the remote control to select it. Again most templates offer full customization for this menu type: menu duration, background video and audio, and header and "no subtitle" text.. Depending on the template, the number of audio/subtitle files that can fit on one menu page is limited. If necessary, additional menu pages will be created and accessible through a "Next" button. The name of the actual audio or subtitle files that appears can be edited in the "Audio" and "Subtitle" tabs: go to "show advanced" and edit the text in "menu text". With ConvertX you can customize most menus (depending on the template used) by creating your own background, changing the text, adding music, changing the duration, etc. The title menu is a bit different from the other menus, because it can be customized in two different areas: the background and menu text options are in under Title Menu parameters. The individual thumbnails corresponding with every video/titleset that will be converted is editable under each titleset/video listed in the treeview, notice in the screenshot below In Title Menu under Titleset #1 in the treeveiw. Each item can be edited from the treeview. - Default menu template settings: will use the default template settings, i.e. if a menu such as "Default, simple menu" is selected you will have a blue background image that was made and is provided specifically in this menu template. - Use a custom file (Video or Still image): if you want a different image or video playing in the background, this will open a browser so you can select the new file on your computer. If you select a video file, you will be asked if you want to use the audio from this video. - No video/image: will remove the background image and leave it blank which = black. File name: displays the path file and name of the file that will be used. Starting time: of the thumbnail, so you can indicate the exact timing of the beginning of the extract that will be played inside the thumbnail, meaning if you want the video not to start from the beginning (to avoid playing trailers, etc.) or if you want to show a specific scene of the video. Opacity: is the transparency filter that will be applied to the image, if you want to see the video/image completely, set the value to 100. If you'd rather have less opacity and have the image shown with with a hinted color (mainly when using the "glossy" menu templates, then you can edit the transparency value here: on a scale of 0 to 100, 0 being totally transparent (you won't see your image) and 100 being the brightest. Duration: of the video that will play in the thumbnail. The duration of the menu can be set either by changing the value of the background audio or background video. The longest value of either audio or video will determine length. If one is shorter than the other the shorter one will loop. You will be able to change the text in the first field on the left, a green light show that the lenght of the text will fit on the screen. If the light is red then a warning will appear, showing that the text will not fit in which case various things could happen - see the General settings tab DVD Menus and the information beneath "If a text label is too large in the menu then . . . "
In this new window, at the top you can see these styles listed in a drop down menu. Changes made below will be saved to the current style selected. Click on the A+ if you want o add a new style or the A- if you want to delete a style selected. For basic editing it is recommended to completely ignore the styles. Simply open the text style editor window (not having changed the style used in the drop down in the treeview) and choose the Font, size, style (Italic, Bold...) and colour of the text. You can upload your own font if the one you want isn't listed, and change the code page if your text is in a language with special letters. A preview window on the right shows the result. Once you're happy with your changes, click OK.
For a more advanced guide on text customization, check out this post. ConvertXtoDVD lets you decide which menus on how menus are linked to one another. To apply your DVD behavior for your project, use the options in the treeview listed under Title Menu parameters (see below). To set your preferences as default for all your future projects, do the same in "General Settings" "DVD menu". Play titles one after the other: plays titles/videos one after another without going back to the menu at the end of each title. Skip root menu initially: when a title is selected from the title (main) menu, it skips the root menu and plays the title directly. This option is ignored if there is no title menu. Return to title menu after titleset playback: when a title finishes playing, you are brought back to the title (main) menu instead of the root menu. This option is ignored if there is no title menu. Don't create title menu for single title: if there is one titleset only, the title menu will not be created. A title menu is useful if many videos are converted as it is the menu that allows you to select which video to play. This title menu is not useful if just 1 video is being converted. How to play the video straightaway? If you want the video to play straightaway without having to go through any of the menus, go to "settings" "DVD menus" and choose the option "Auto-start playback". How to go to the root menu straightaway? If you only have one video, you might want not want a title menu in which case check: "Don't create Titlemenu for single video"
How to eliminate one of the settings menu? You can only do this by selecting a menu template that doesn't have the menu you don't want to see (see templates options). How to show only the main "title" menu with the different video selection? If you only want to be able to select one of the videos, and then play the video straightaway, without having to go through the root menu, select "Skip root menu initially". You will still be able to access the settings for each file with the "audio" "subtitles" and chapter" buttons of the DVD remote control. NB: in some rare cases, the DVD player will impose its own behavior, and the selected settings will not be applied. You will need to configure your DVD player settings to get the desired behavior. ConvertXtoDVD has been designed to respect the defined and official DVD standard. How to change the menu duration? Indicate the desired duration under "duration". Note the total menu duration will add a few extra seconds because of fade in/out effects, the final menu duration is indicated at the bottom of the window. If you add a separate audio and video, the duration can be changed in both places ("background video" and "background audio" as shown above...), if the menu duration isn't the same for both audio and video, the longest one will play and the shortest one will loop. NB: in some menu templates, the titleset menu shows a thumbnail of the titlesets. You can also edit this thumbnail to show any video/image, but this thumbnail duration cannot exceed that of the menu itself. On the other hand you can have a shorter duration for the thumbnail, in that case it will loop. How to Add a picture in the background of any menu? Depending on the menu template you've chosen, the background of the menu plays the video in the background. Use the Black Mirror with video and the Glossy templates if you want to have the best editing possibilities. You have the possibility to use your own image or video in the first option. Click on it, a browser will open where you will be able to search and load your video/image. You can also decide where the video will play from, if you don't want it to play from the beginning. In Starting time indicate the start time where the video should be played from. By default, they play the video with a middle opacity, which you can edit thanks to the "opacity slider". You will see the result live in the preview once you've clicked on "OK"
You can edit the thumbnail and any other menu the same way, if you've picked a menu template that allows such edition. How to resize an image to fit perfectly in a menu? Please check out this post for a detailed explanation. How to set your menu format? The menu will be displayed according to the format selected (4/3 or 16/9) in the tab "output". If Automatic has been set in the Default settings, then the menus will be the aspect ratio of the first titleset in the treeview. How to rename the DVD? The top one that is inside the Menu is the title that will appear on the Title menu template, shown in the preview on the right. The bottom one is the actual name of the DVD, that will appear when you load the DVD in your player. both are interconnected: if you change one, the other will automatically be changed as well. Let's now focus on how to edit this title. How to save your preferred menu settings and text customizations? In the default settings, go to the tab Menu options and press the button Edit current template fonts. For details see this forum post.